Abortion, fundamentalists, physicalism, and evolution: Sawyer’s “Calculating God” and some contentious issues | J.W. Wartick -"Always Have a Reason"
I have already written on Sawyer’s Calculating God and how it presents–in great detail–the teleological argument. However, Sawyer’s scope in this masterwork of science fiction was not limited merely to a discussion of heady philosophical and scientific arguments for the existence of God. Instead, he touched on a whole spectrum of controversial issues, giving answers that were often embedded into the narrative itself, and always thought-provoking. Sawyer lumps fundamentalism in with the discussions about abortion. Unfortunately, fundamentalism is portrayed in the worst possible light, not unlike in the work of Ben Bova. The religious fundamentalists here are extremists bent on destroying anything that counts as evidence against their worldview. As such, they are first introduced as blowing up an abortion clinic (86-87). Frequent readers of my site know that I write often from a pro-life perspective but also that I am very much opposed to violence in this opposition. Unfortunately, such principled opposition is not portrayed as an option in Sawyer’s work. It may take a moment, but think about it: Sawyer expresses incredulity at this notion through the alien Hollus, yet in what may have been a Freudian slip, calls the unborn “children.” Yes, of course I’m opposed to killing an unborn child! In fact, this dialogue reveals exactly what is at stake in the abortion debate: if the unborn is not a human person, then who cares what you do with it? But if it is, then what relevant status difference is there between a child who is located inside the mother as opposed to outside the mother? Again, I’ve written more on this issue elsewhere, but it is important to note that even in expressing incredulity about this, there is a revealing phrase: child. It is an unborn child killed in abortion. Disturbingly, the book touches on an issue very relevant to the personhood debate: children who are screened for disabilities. In one scene, Hollus is confronted by a child with Down’s Syndrome. He notes nonchalantly that a similar disease is almost always “screened for” in the wombs of the alien mothers (115-116). Unfortunately, this exact thing is happening right now. Unborn children who are shown as having Down’s Syndrome are being aborted inside their mothers at an alarming rate. I can’t help but see this as a modern eugenics movement: killing those we deem unworthy of life for a genetic reason. The logic that this entails is even more disturbing. Of course the same fundamentalists who bombed the abortion clinic were also out to destroy any evidence for evolution. They sought to destroy a fossil exhibit which they saw as an affront to God. Thus, I can’t help but think that the way Sawyer presents fundamentalists is a bit disingenuous. Not all fundamentalists are incapable of reason and violent. Indeed, almost no fundamentalists are like this! Thankfully, there are positive examples of religious persons in Calculating God, including Tom’s wife. Interestingly, in the book, cancer turns out to actually have a purpose… in the sense of being a side-effect of something great: the ability to fuse genetic codes with other intelligently designed species. Here it seems Sawyer has employed a great deal of imaginative techno-babble to explore the notion of a physical god, but it also has hints of a greater good theodicy akin to that of Swinburne. The discussion of physicalism in Sawyer’s work is very brief, but enlightening. There is a variety of substance dualism here in the sense of emergence. That is, in Sawyer’s fictional world, intelligence and “mind” emerges from matter once complexity reaches a certain threshold. This is similar to the theories of emergence theorists like William Hasker. I can’t help but find this a bit strange. The people who argue for this type of theory are frequently the same who are very hostile to the notion of anything beyond the physical realm, yet they argue that something aphysical can indeed “emerge” from matter itself. Surely this is a leap of the imagination! That matter has creative force simply because it can reach a certain level of complexity seems to me patently absurd. Not only that, emergence suffers from a second major problem. Namely, if our “mind” is simply a product of complexity in matter, then our “intelligence” is entirely supervenient upon physical complexity. Indeed, our intelligence is a product of that complexity and therefore cannot operate independently of that matter. Therefore, it is hard to see any kind of properties that our minds would have that would be capable of maintaining free will or even rational thought on this theory. Indeed, I have trouble seeing how this theory would be any different from physicalistic monism. The simple notion of evolution is a given in the book. No, it is not friendly to any who are unwilling to accept the notion of “macroevolution,” as the term is used in relevant literature. All the intelligent beings depicted in the book had evolved from a (potentially distinct) distant ancestor. Darwinian evolution is simply assumed as truth in Calculating God. Or is it? The deity presented in the book is not very conducive to undirected evolution via natural selection and chance. It is portrayed as hurling asteroids at the planets where life was developing in order to press a “reset” button on the creatures that were currently dominant there. It also shown that this deity prevented other catastrophes from happening on these planets, thus interfering with natural selection. Indeed, the evolution depicted here is eerily similar to intelligent design, wherein the process is guided by a deity with a specific aim. Indeed, one could argue that the entire book is an argument for intelligent design, albeit divorced from much of the theological framework that many of that movement’s frameworks operate within. Yet I can’t help but find this part of Sawyer’s argument (if, indeed, the intention is to make the argument that theists have it all wrong) is completely off. After all, the “god” of Sawyer’s universe is imperfect and concrete in the sense of physically existing. But this works against his concept of deity as being capable of coordinating the events it brings about. Granted, he could perhaps continue to increase the power of this deity beyond what is clearly outlined in the book, but there are hints that the deity is capable of knowing what is happening on places where it is not present, that it is capable of knowing what will happen with certain directions for evolution, and what will happen at the end of the universe. These work against the notion of God as a kind of blundering physical entity that just happens to be supremely powerful. Indeed, the god of calculating God may not be as hostile to Christianity as it initially seems. It serves as a pointer towards the true God of spacetime. 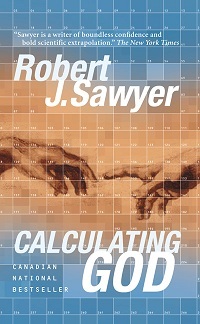 Robert Sawyer, Calculating God (New York: Tor, 2000). « Really Recommended Posts 3/22/2013- Rob Bell, Loftus, and Dawkins, oh my! Good concise overview of a few of the issues brought up in Sawyer’s fine book. I appreciate you pointing out that his portrayal of fundamentalist Christians was unrealistic. I thought the two guys were basketcases usurping the name of “Christian” to cover their evil behavior (lying, murdering).